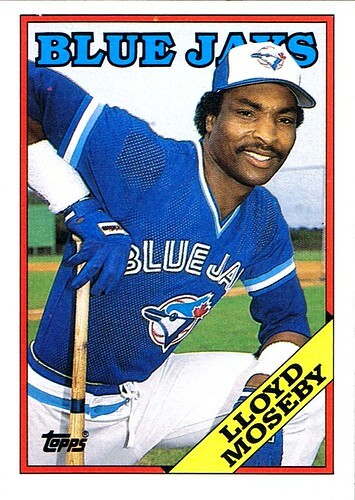 We called Lloyd Moseby The Shaker, and he was part of "the best outfield in baseball" playing center field between George Bell and Jesse Barfield. The Shaker Mo is still the all-time Blue Jays leader in stolen bases and he was an all-star in 1986. A likable player who signed this autograph for me, future generations will remember Lloyd Moseby for his "Shaker's Rap". If you haven't yet heard "Shaker's Rap", you're in for a treat. Get on over there and hit play. That had the potential to be one of the best outfields of all time, as it stands, we will never see an outfield like that for a long time. We had Shannon Steward, Shawn Green and Mondesi...I suppose you could put the Carter/Devo Outfield in that mix too. ACtually, I thought Devo was a better defensive Center Fielder than Moseby, Moseby was definitely a better Offensive guy. Call out all of your avid readers inquiring whether anyone has the infamous video of Mr. Moseby and Mr. Barfield singing the song that they wrote. It's a great watch, please does someone have this video somewhere? Why do I not know of this video? Yikes. He's the reason I still wear #15, who didn't love some Shaker? And why aren't there any good nicknames like that anymore? I had to deal with the Astros' announcers call Jeff Bagwell "Baggy" for a few years there. Lame. As the fellow who brought 'Shaker's Rap' outta the vinyl vault (and got him to autograph the cover when I met him a few months back), I am aware of that video. Or, at least, that clip that gets used in some Blue Jay promotional stuff. I don't know the audio at all and can't remember where it was from. The person who finds it wins a high-five from the Wang.